The Nautilus Award recognizes books, audio books, and e-books that promote spiritual growth, conscious living and positive social change. Previous winners include Thich Nhat Hanh, Eckhart Tolle, and His Holiness the Dalai Lama. 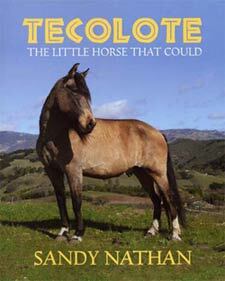 “A Beautiful Book for Horse Lovers, Tecolote was born prematurely and almost didn’t make it. But the little horse showed courage and an incredible will to survive. This is his story. Tecolote had to overcome not only a premature birth on a freezing night, but he had a problem with his front legs that made it difficult for him to stand. This was a wonderful, sweet, touching little book. Tecolote came into this world early and not in the best condition. With love he was able to overcome his difficulties and grow into a beautiful horse. Reading his story was a real treat. The pictures in the book are beautiful and very expressive. He overcame many obstacles and brought so much happiness into the lives of those around him.